Just like a day at the spa, indulging in massages and other pampering treatments can rejuvenate your body, a few hours of special treatment can rejuvenate your hair. In a day and age where pollution and chemicals play havoc with your hair, a spa treatment can help restore it to its natural beauty, thus we are very glad to introduce one of our newest spa treatments – the Aromatherapy Hair Spa. Aromatherapy Hair Spa treatment can be the best solution for nourishing and rejuvenating your tresses. To start with, a special spa shampoo will be applied to your hair while giving you light massage in the head that gives primary relaxation. After shampooing, your hair will be rinsed with luke warm water then towel-dry to remove excess water. This is followed by the application of Elite Nails’ special formulation of hair masque. Enjoy the citrus inspired aroma hair spa that will give lustrous shine and bounce to your hair. 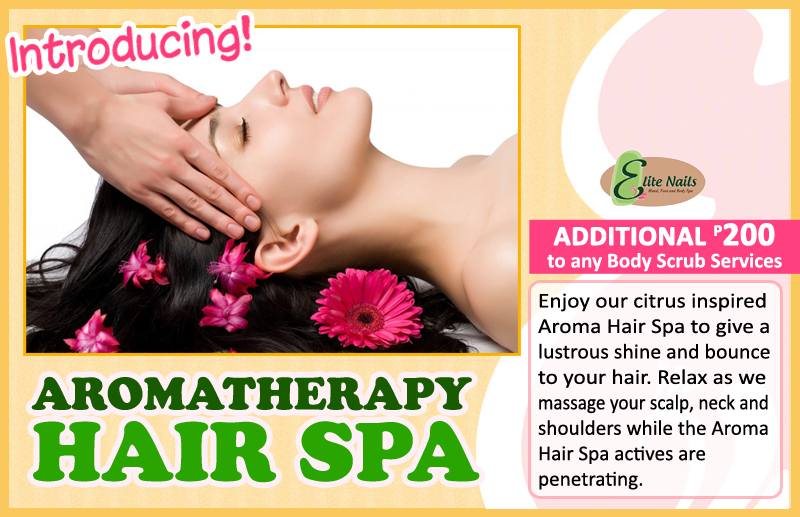 Relax as we massage your scalp, neck and shoulders while the aroma hair spa actives are penetrating. The masque is massaged into your scalp to relieve the dryness that inevitably becomes the norm due to treatments like perming or straightening or even the use of shampoos and conditioners all the time. The masque is applied to cover every strand of the hair. Our spa attendant will inform you when to wash the masque off your hair and walk you through our shower room with complete amenities you may need. Hair spa is also a treatment for those who are facing hair loss, and those with dull and damaged hair. This treatment is claimed to arrest hair fall and regain the lost sheen and bounce of the hair. Even hair problems, such as split ends, dandruff, itchy scalp, dandruff, etc., can be reduced with this treatment. For reservations, you can call these numbers - 09336537276, 09215918801, 09178086950 or at (02) 480-6832. You can also get updates online via our Facebook fan page and at Twitter (@eliteNailsSpa) too.